Hi! My name is Kat. Nice to meet you! Re: Exclusives: Good or Bad? Since we cannot safely predict what the loss of exclusives would do to a toyline, it remains a necessary evil. I don't like it, but I can at least somewhat understand why it exists. The only way to prevent exclusives would be an organized boycott of those dolls, but regular old mom and dad of little Jenny isn't going to be on on the big bad secret, and kids do buy (or at least get) more toys then collectors. I wouldn't have a problem with Exclusives if more and more toys got properly distributed. To me, there are two sets of exclusives; Ones that are reasonably okay to find, like Ghoulebrities in Londoom -I can still find these dolls a year later, they were never a huge pain to find. Sure, it's a little annoying having a K-Mart exclusive, especially since ours basically don't stock anything, but I can go online, either here or to the website. Then there are ones like City Shriekers three pack with Catty that we never got in the states. Or IHF Venus and Cleo - which was so poor, I never saw Cleo in person at a store and we only had three versions of international Venus before never again. Or Ghoul's Alive wave 2, which we got Torelai and Deuce once, but never Robecca. I've been doing this for three years now, and I can't recall it being THIS terrible, or THIS many lines that seriously go missing at our border when everyone else seems to get them. I hate store exculosives. The stores jack up the prices and some of them are really hard to find. It's smart marketing for a store. If every other store carried the same thing then you have to compete based on price/sales. Having a different assortment of product drives interest and sales. As a collector, it makes shopping a challenge but I haven't really ever minded the hunt. There are a lot of folks here that help so unless that changes I am okay with it. Even if they stopped doing official exclusives there would still be what I consider to be "exclusives by default" when only one store bothers to buy an assortment. And exclusives are important because they allow production of more risky things. Do you think they would have made a boy 2 pack if it wasn't an exclusive? I do wish Mattel's own online store would be an exception tho. Even if they stopped doing official exclusives there would still be what I consider to be "exclusives by default" when only one store bothers to buy an assortment. Yep...i'm looking at you, Fairest on Ice. I find store/country exclusives annoying. It creates a false dolly economy, giving scalpers a target product, and artificially inflating prices on the secondhand market. There were a lot of world exclusives with MLP in the 80's, which did make collecting them (much later) more fun and challenging- but this wasn't done to purposely make them into harder to find exclusives. It was just how the toy market was back then. World wide releases of toys were much more rare back then. Most countries had their own toy lines and their own versions of wider release toys like Barbie, He-Man and GI Joe. 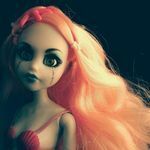 I feel like a lot of the big companies are exploiting the hobbies of fans and collectors on an industrial scale, and Monster High is no exception. Have to say I was very disppointed to see MH getting SDCC exclusives. When I started collecting MH, I hoped it would finally be something fun and inexpensive. That's because Lalaloopsy has declined a lot. Back in its heyday there were quite a few exclusives. There were the Target exclusive holiday Minis and occasionally there would be an exclusive large doll. The only exclusives I strongly dislike are the ones for membership clubs. Otherwise I accept it as a way for them to be able to take risks. I don't think a boy 2 pack would have seen a regular release. As it is it kinda shelfsat. I can't stand store or "con" (like SDCC) exclusives. Especially if it's a new character, like Gilda and her sole release only in a Target 5 pack...or Manny along with Iris...OR a lesser produced doll like Swim Class (?) Holt being a Justice exclusive. That one REALLY bugged me since Justice isn't easy for me to get to, and I was never able to get him for retail complete. Scalpers seem to love to take advantage of exclusives too, with their hoarding and re-selling at ridiculous prices. This was true with Haunted Rochelle (she never showed up at any Walmart I visited), and is true ATM with the Maul Monsteristas supposedly being a Target Exclusive per their site, but trying to find the pack or even one of the dolls from it at retail is impossible, and the only sellers who have it on eBay want $100 for all 5 dolls and $30 on average for a single doll. I don't think a boy 2 pack would have seen a regular release. As it is it kinda shelfsat. I hear ya, I was disappointed to see them release a 2 pack of boys who've already had multiple releases, Gil & Deuce...too bad they couldn't have done it with Holt & maybe Heath, or even Manny...I know boy dolls don't sell (or so I'm told), but I have to wonder if they'd actually put 2 more rare boys in there instead, would it have sold better. That was the main reason I didn't buy it--I already had Gil and Deuce. If it had been 2 boys who hadn't been released yet or one that was hard to find, like Holt, I would've grabbed that pack so fast. I hate the store exclusives. Especially the Target ones, since we don't have a Target nearby and they don't always have their exclusives in stock online. And they get some of the best MLP and doll exclusives. It's so weird, one Target near me is pushing the Dance class 5 packs at full retail, while another one 30 minutes away has the Disembody pack. But where in the world is the Maul Monsteristas pack??? And how did Mexico get so many? Well, as someone who does not live in the US/UK/AUS/Canada, yeah..I'm not a fan. I too, would like an end to exclusives. Plus, it's not just exclusive dolls, it's the distribution as a whole. They really should do something about it. So I would love if they got rid of store exclusiveness and started distributing all the dolls properly. Being from NZ & not having any TRU or Target (or Walmart, obviously) stores here, store exclusives really irk me. But at the same time, I love the HQ Target exclusives that compliment an established line, like Gloom & Bloom or Freak du Chic, or even if it's a line on it's own like Power Ghouls or Scary Tales - some of these are my all time favourites for certain characters (GNB Jinafire, ST Clawdeen). I also really like some of the exclusive multipacks for TRU - the Mansters was so clever with the games & tiny little pieces - and at least TRU exclusives are available for quite a long time (barring ILF Cleo & Venus). I'd say I have more issues with distribution than simply store exclusives. Sometimes we get US store exclusives at alternative retailers like Bloodgood & Haunted Rochelle, other times we don't even get non-exclusive lines. But then again, with our outrageous prices, sometimes I'm glad eBay & Amazon exist, because even with shipping costs, it's cheaper than buying locally. My grudge is with country exclusives. I could get Finnegan who was a Mattel exclusive but the shipping was too expensive. Got him through another online store and it would have been even more expensive, but his box was damage so he was on sale. I think they are trying to atune with not bringing Gloom and Bloom, swim class lines, Ghouls sports, Manster 2pack & some 3 packs (Ghoulebrities, both byby for example). Others just get here around a year after. I hate Kmart exclusives because my Kmart closed down.